The mater of the astrolabe is made of two soldered layers of brass, one for the plate and the other for the limb and the throne. The face of the limb is decorated with four circles on the border and is divided into two concentric circles. The outer one is engraved only on the two upper quadrants with degrees, with 90? at the zenith, divided to 5? and to 1?, numbered by 5?. Superimposed on it are the hours, numbered 1 to 12 twice, every 15?. The inner circle is divided into four quadrants of 90? to 5? and to 1?, numbered by 5?, with 90? at the zenith. 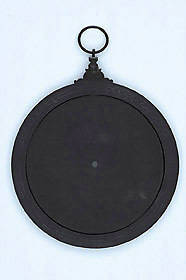 Suspension is by means of two rings and a saddle-like shackle decorated with a five-leaf flower. The throne is decorated with two flowers resting on scrollwork and is filleted on the sides. The three plates are all engraved with east-west and meridian lines, both tropic lines (indicated 'CANCER' and 'CAPRICORNVS') and equator line. The equator line is engraved, where it is cut by the meridian, 'ARIES' and 'LIBRA'. The astrological houses are numbered 1 to 12 and the unequal hour lines are numbered 1 to 12 as well. The twilight line is indicated 'LINEA AVRORE'. The almucantars are engraved every 2? and are numbered from 10? to 80? every 10?. The azimuth lines are engraved but not numbered. The first plate is engraved for 'LATI XXXIX' and 'LATI XLII'. The second plate is engraved for 'LATI XLV' and 'LATI XLIX M XXVII', (49? 27', the latitude of Nuremberg). The third plate is engraved for 'LATI LIII' and on the other side for 'LATI LIIII'. This side of the plate, as the mater, has been blackened perhaps in a gas-lit room in the nineteenth century. The back of the mater is marked on the limb with a scale of degrees divided into four quadrants with 90? at the zenith. The scale is divided to 5? and to 1?, numbered by 10?. On the inner circle they are numbered by 5? from  to 10?. Further to the centre is a circle with the names of the zodiacal signs, then a calendar scale divided by the day, with the names of the months engraved. The first point of Aries corresponds to the 11th of March. In the bottom half of the central area is a double shadow square divided to 3 and to 1, and numbered by 3, and indicated 'VMBRA RECTA' and 'VMBRA VERSA' on each half. Inside it is the signature 'GEORGIVS HARTMAN NOREMBERGE FECIT ANNO M D XXVII'. In the top half is the Laudian coat-of-arms, those of the archbishopric of Canterbury impaled with his own. Around it are the unequal hour lines, numbered 1 to 12. The rete, rule and alidade are missing. See R. T. Gunther, The Astrolabes of the World (2 vols, Oxford, 1932), vol. 2, p. 436.